John Greed is based in the beautiful and historic city of Lincoln. We're a great mixture of talent and ideas, passionate about jewellery, and all working towards one goal – using our combination of creativity and technical wizardry to bring you the best possible shopping experience. We want to amaze and delight you with our jewellery, our shopping experience, and our focus on customer service. We strive to deliver the extraordinary. We offer you both our deep technical understanding of jewellery, and our excitement at how wearing jewellery transforms and redefines us all. When you're looking at our website, we don't want you to feel you're merely browsing a catalogue. We want you to be inspired and excited. We want to fire up your imagination, and show you who you could be, wearing our jewellery. John Greed brought to life his passion for selling jewellery after working on his sister’s stall in Covent Garden as a student. John believed jewellery should be exciting, innovative and expertly designed and that it should be sold in a way that reflected that. Realising that most jewellery retailers did not fulfill his idea of passion, theatre and make believe, John Greed Jewellery was born. Since John arrived in Lincoln in 1991 with just a bicycle and £100 in his pocket, the company has come a long way. Now a premier jewellery destination both online and with a flagship Lincoln store, John Greed provides any jewellery lover with the perfect handcrafted designs, designer labels and unique brands, whatever style, personality or occasion. Combined with unparalleled customer service, immaculate packaging and presentation, John Greed Jewellery now attracts tens of thousands of visitors each day to it’s constantly updated website. Today John Greed Jewellery is one of the UK's most exciting and fastest growing independent jewellery retailers. With both a strong online presence and a flagship store in Lincoln, John Greed Jewellery specialises in selling top, trend setting jewellery brands and exclusive engraved designs, having previously personalised over 200,000 Pandora products. 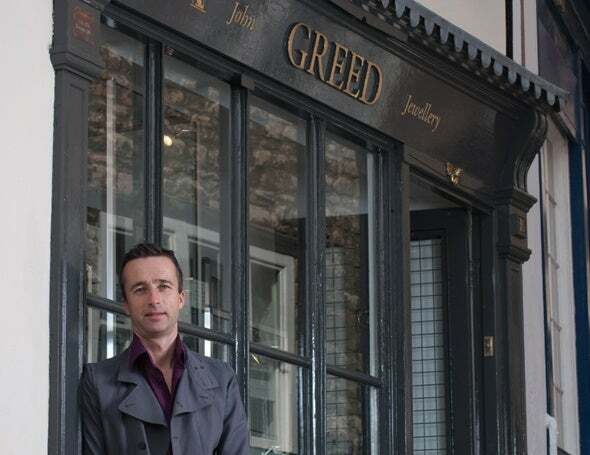 With an innovative approach, an unrivalled range of jewellery combined with a fanatical customer service ethic it's no secret why John Greed Jewellery has been so successful.